Our beginner's guide to Square Enix's frantic fighting game. Got a thirst for some furious fighting? 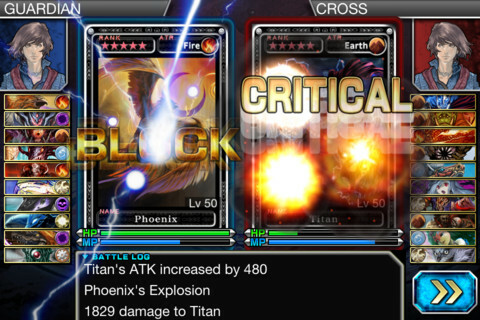 We reviewed Square Enix's perfectly polished Guardian Cross earlier today, and have since put together a guide to get you on the road to victory. How do I spend the currencies in Guardian Cross? 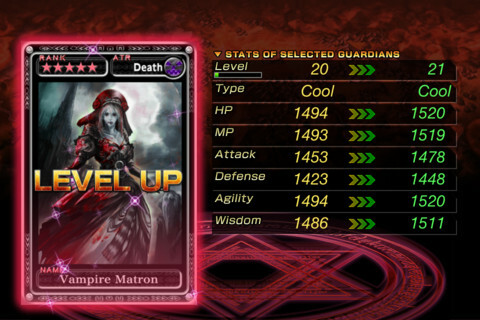 There are three critical currencies in Guardian Cross: Guardian Points, hunting tickets and Coliseum pieces. Guardian Points are spent whenever you enhance cards with duplicates, hunting tickets allow you to head off into the wilds to gather more creatures, and Coliseum passes allow you to take part in the multiplayer component of the game. 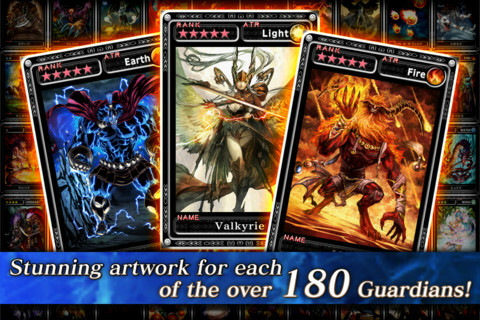 In the early stages you'll want to take every card you can in, before combining cards! You can take a maximum of ten cards into any single battle, so make sure you've fleshed out your deck fully, particularly when it comes to multiplayer fighting. Combine cards once you've gone over the ten card limit. Note that if you aren't aware of the cards you're going to be facing off against, it's important to fight with a deck that maintains a good balance between all stats. Specialize in certain stats only when you have some intelligence about the enemy you're about to take on. How does the combat work? It's very simple. Your deck of cards will be paired off against your opponent's, one single card after another. Defeat your enemy's first card and it will be destroyed before their next warrior steps up to try and finish off your successful victor. Cards are whittled down in this way until a player runs out of cards to play. What are Guardian Cross Coins? This is the in-app purchase currency and is required whenever you want to take part in the more advanced Guardian hunts, or if you need to buy recovery potions. They're available in different quantities, with the pricing varying across regions. Check in-game to see how much they'll set you back. Where should I take part in Hunts? You'll be restricted to hunts that are within your level range once you've entered the Hunt section of Guardian Cross. Here you'll have the chance to either take part in regular hunts, or use some of your Cross Coins to enjoy an enhanced version of the map where you're more likely to find rarer Guardians during your safari. You only have 60 seconds on each attempt to bag as many Guardians as you can, and you should make every shot count as reloading will eat up a fair chunk of this precious time. Once you've finished off a roaming monster, follow the red arrows to move your scope towards the next prey. How does the Coliseum mode work? 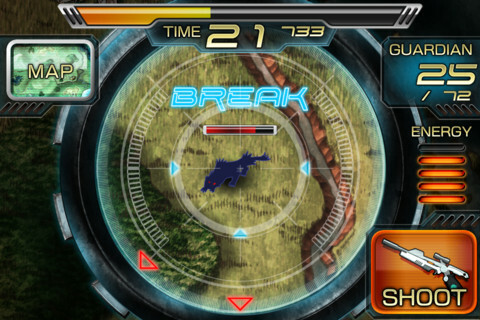 This is the multiplayer section of Guardian Cross and is accessed from the main menu. Here you can select an opponent of an appropriate level to do battle with. You'll need to face off against three different opponents for the result to count towards your rankings, which are tallied up approximately once every week. Depending on your level of success, you'll be rated and awarded a prize that corresponds to your rank. How do I fight my friends? First of all you'll need to invite them through the game's interface and exchange Friend codes. Once you've joined up, you can set up a special mock fight between the two of you, although note that you can only do this once per day per friend, with up to ten different friend duels allowed in any given day. Fighting with friends rewards you with Friends Points which can be used to purchase useful items in the points redemption section. Can't find your Friend code? It's just off the main Menu, found under Record. Regular players will receive bonus rewards for logging in every day, so even if you don't have a lengthy gameplay session it's well worth firing the game up briefly to grab the goodies. You'll be able to access these bonus items from the box in the top right-hand corner of the screen.